I love Greek myths, and I believe that reading and studying them are an important part of a quality education. 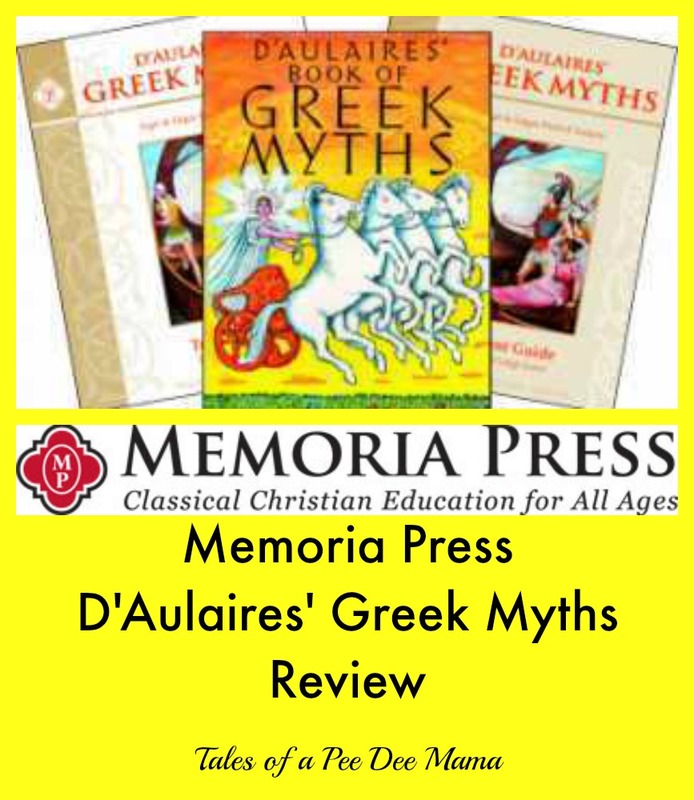 I was thrilled to have the opportunity to review D'Aulaires' Greek Myths set from Memoria Press. D'Aulaires' Greek Myths Student Guide is a 108-page, soft-cover workbook containing 25 lessons, 5 review lessons, lists, maps, and a pronunciation guide. Each lesson is divided into 4 sections: Facts to Know, Vocabulary, Comprehension Questions, and Activities. The Facts to Know section covers important information in D'Aulaires' Book of Greek Myths - names of gods and goddesses and what they are the god/goddess of, important places, and important objects included in the myths. The Vocabulary section includes new or challenging words for the student to define and discuss either before or during reading the section in D'Aulaires' Book of Greek Myths. The words are given in the context of the phrase in which they are used in the book, which helps make them easier to learn and understand. The Comprehension Questions section is pretty self-explanatory; it includes questions that show the student's comprehension of their reading in D'Aulaires' Book of Greek Myths. The Activities section lets the student focus on the gorgeous pictures in D'Aulaires' Book of Greek Myths. There are items for the student to identify in the pictures, as well as other activities such as timelines, family trees, discussion questions, drawing pictures, and more. The Student Guide also includes 110 Drill Questions for Greek Mythology. The pronunciation guide at the back of the Student Guide was a huge blessing for Little Red and me. There are so many names of gods and goddesses as well as places that are difficult to pronounce just by looking at the name. Having the pronunciation guide made me more confident in reading the book with Little Red. D'Aulaires' Greek Myths Teacher Guide is a 155-page, soft-cover book containing the answers to the activities in the Student Guide as well as tests and answer keys. The tests have students identify different characters in the Greek myths, answer questions about the myths, provide the vocabulary word for given definitions, and locate places on maps. D'Aulaires' Book of Greek Myths is a 192-page, soft-cover book. containing over 40 Greek myths. The myths are accompanied by beautifully detailed illustrations, some in color and some in black and white. The flashcards are printed on cardstock and are perforated so that they can be easily separated. Most of the flashcards correspond with the Facts to Know from the Student Guide. Each flashcard has the name of a person, place, or item from the myths on one side and a short description on the other side. Little Red has used this for reading. We broke each lesson in to several days. On day 1, she and I go over the Fact to Know, and she gets out the corresponding flashcards to practice. We also read through the Vocabulary section so she can be familiar with the words. On day 2, she reads the appropriate pages from D'Aulaires' Book of Greek Myths. On day 3, she completes the Vocabulary section, writing a definition or synonym for the vocabulary words. She also completes the Comprehension Questions. On day 4, she and I go over the Activities section. She identifies the various items in the illustrations, and we discuss the discussion questions. Memoria Press has this set marked for grades 3-6. While Little Red is a pretty good reader for a 5th grader, she struggled some with comprehending some of the myths and completing some of the activities. I think this set could easily be used for 7th or 8th grade. In fact, Ballerina has been asking to do this study so I might include this as part of her 8th grade curriculum next year. Are you interested in what others have to say about Memoria Press? Check out more reviews from the Schoolhouse Review Crew.